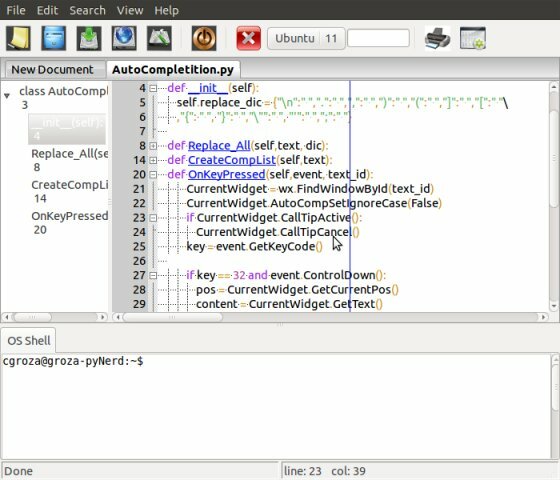 A new Python IDE intended for beginners. It is fast, light weight with common features and many others in coming. It's focus is simplicity and ease of use. Failed to install in Ubuntu 10.10….dunno why. Thinking I should try the Synaptic Package Manager rather than (what I thought) the failed attempt of installing the .deb file with the Ubuntu Software Centre, I found the package was listed as installed by Synaptic. Then fruitlessly searched the Applications, Places & System menus for a start icon. Finally started it with “Run Application..) – ALT F2, that is. It Won’t install on a 64bit system. Can’t be installed properly. Can’t find program. Hello, I am the gecrit’s developer. I was surprised when I found my software here. Sorry for the hard installation progress, I will add an icon soon enough, maybe this week. The deb adds a launcher in the menu now.